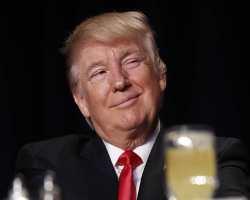 During remarks at the National Prayer Breakfast, President Trump said he wanted to ‘totally destroy the Johnson Amendment’. 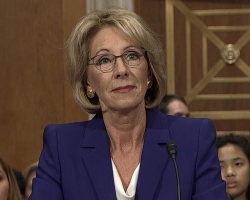 The amendment is a rule that prohibits churches from giving money or endorsing candidates as part of the deal for federal tax exemption. Trump’s statement puts religious freedom in danger and opens the churches up to dark money that has ruined our election process. This entry was posted in Entanglement, Politics and tagged Donald Trump, Johnson Amendment, Pulpit Freedom Sunday, religious freedom, tax exemption on February 2, 2017 by Doug. 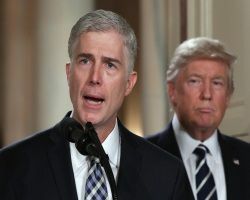 It doesn’t take much research or ‘soul searching’ to know that any Supreme Court nominee by President Trump would NOT be friendly to issues of concern to secular people. You don’t even need to do any Internet searching because the major freethought groups already have the goods on Neil Gorsuch. Obviously, any ‘little Scalia’ is no friend of ours. This entry was posted in Courts, Entanglement, Politics, Religious Intolerance and tagged Burwell v. Hobby Lobby, Donald Trump, Neil Gorsuch, religious freedom, US Supreme Court on February 1, 2017 by Doug. Religious conservative and FOX news contributor Todd Starnes wrote on June 29th that the recently released US House Republican’s Benghazi report noted that members of President Obama’s administration bullied a Christian pastor about a film he promoted that insulted Islam. Starnes claims that breeched the church and state wall. 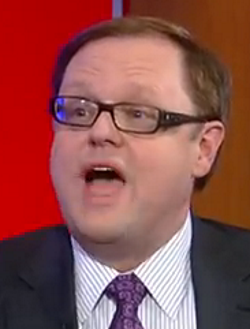 For a ‘reporter’ with a history of ethics problems, Starnes unsurprisingly gets this so-called ‘violation’ wrong. This entry was posted in Entanglement, Media, Religious Intolerance and tagged church and state, Islam, religious bigotry, religious freedom, Todd Starnes on June 30, 2016 by Doug. 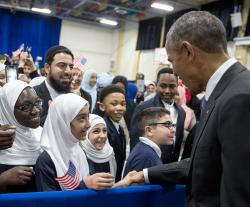 On Wednesday (2/3/2016), President Obama visited a mosque for the first time while in office. I applaud his visit and his remarks against bigotry toward Muslims, but when he talked about religious freedom, people who don’t subscribe to any religion seemed not to be included. This entry was posted in Entanglement, Groups, Politics, Positive, Religious Intolerance and tagged 2016 US Presidential Election, Baltimore, Mosque, Muslim, President Obama, religious bigotry, religious freedom on February 4, 2016 by Doug. 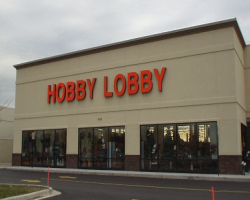 The Center for American Progress (CAP) sees the problem with religious freedom after the Hobby Lobby court decision in 2014. Religious freedom is being used as a weapon to discriminate. CAP has some ideas on how to restore the religious freedom balance. They all sound good. This entry was posted in Courts, Entanglement, Politics, Positive and tagged Burwell v. Hobby Lobby, church and state, discrimination, LGBTQ, religious freedom, RFRA on October 20, 2015 by Doug.